The Oregon Association of Nurseries is saddened to report the passing of Evelyn Schmidt, the cofounder of J. Frank Schmidt & Son Co., a wholesale tree nursery based in Boring, Oregon. She died July 6, 2017 at the age of 96, with her children by her side. Evelyn was born August 18, 1920 in Swissvale, Pennsylvania. As newlyweds, she and her husband, J. Frank Schmidt Jr., founded the nursery in 1946 following their honeymoon. It eventually expanded to 2,500 acres across multiple sites near Boring, in the Willamette Valley, and in Eastern Oregon. The company is well known throughout the industry for its signature tree introductions. She was laid to rest July 7, 2017 at Douglass Pioneer Cemetery in Troutdale, Oregon, next to her husband, who died in 2004, and their eldest daughter, Joyce, who died in 1965. She is survived by daughters Jean Webster of Fresno, California and Jan Barkley of Boring, son J. Frank Schmidt III of Boring, nine grandchildren and nine great-grandchildren. A Celebration of Life will be held on Evelyn’s 97th birthday, Friday, August 18, 2017, from 3–6 p.m. at the J. Frank Schmidt Jr. Arboretum, 9500 S.E. 327th Ave., Boring, Oregon. A 4 p.m. presentation will include stories, blessings and birthday cake. In lieu of flowers, the family suggests remembrances to Mt. Hood Hospice, the Leukemia and Lymphoma Society, or a favorite charity. Below is her full obituary, courtesy of J. Frank Schmidt & Son Co.
Evelyn Louise Mantsch Schmidt died peacefully on July 6, with her children at her side. A resident of the Troutdale-Gresham-Boring area for more than 70 years, she was co-founder with her late husband, J. Frank Schmidt, Jr., of J. Frank Schmidt & Son Co., a wholesale tree nursery based in Boring. Having declared at the age of 10 that she wished to marry a farmer and have twins, she accomplished these and many other goals during her long life. Born on August 18, 1920, in Swissvale, PA, Evelyn was the youngest of four children born to George and Sarah (Miller) Mantsch. She grew up in the Pittsburgh suburb during the Great Depression with siblings Hilda (Larson), Elsie (Hearn) and Bill Mantsch. During frigid winter evenings, the family huddled for warmth by the kitchen stove. It was stoked with firewood from the nearby woods, gathered because they could not afford coal. Meals of cornmeal mush were supplemented by free milk distributed weekly at the local firehouse. Evelyn recalled never going to bed hungry or feeling as though they were poor, but had vivid memories of her family singing, playing cards and being together. During her high school years, Evelyn taught Sunday school and sang in the choir. Her combination of singing ability and skating skills earned her a spot in the Ice Capades, a traveling ice skating show founded in Pittsburgh in 1940. She performed with the Kinder Sisters for two years, and spent two more years as a substitute skater and behind-the-scenes voice for several famous Ice Capades performers. After paying off her parents’ mortgage with some of her $125 per week earnings, she left the show to visit her sister Hilda and family in Gresham. She was soon introduced to J. Frank Schmidt Jr., the farmer who was to become her husband and the father of four children including the twins she had dreamed of. Married in her parents’ home on October 12, 1946, the newlyweds set off on a cross-country honeymoon to Oregon in their shiny new 1946 Studebaker. Upon arrival, they planted their first trees on five acres off Halsey Street near Troutdale. The nursery eventually expanded to more than 2,500 acres and is known around the world. 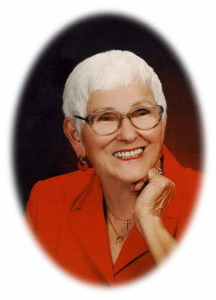 Evelyn was active in the Oregon Association of Nurseries and the American Association of Nurserymen and was a longtime member of Ascension Lutheran Church. She played tennis well into her 80s and loved dancing at the Gresham Senior Center and Gresham Elks Lodge, where she rarely missed Thursday bingo. She volunteered at Legacy Mount Hood Medical Center and Gresham Historical Society, to which she donated her ice skates, dancing shoes and other memorabilia. Evelyn was preceded in death in 2004 by her husband of 58 years, and by their eldest daughter Joyce in 1965. She is survived by twin daughters, Jean (Gordie) Webster of Fresno, CA, and Jan Barkley, and son J. Frank Schmidt III (Barbara) of Boring. Nine grandchildren survive her: Julie Schmidt (David) Rasmussen, John and Carrie Schmidt; Gordy (Stephanie) Webster, Chad and Ashley Webster; Sarah Barkley (Paul) Fisher, Stephanie Barkley (Keven) Lehl and Sam (Natalie) Barkley, Jr.
Evelyn doted on her nine great-grandchildren: Laelie, Tirien, Emmalyn, Karielle, Bryn, Barrett, Everlee Joyce, Avery and Jay, and was looking forward to the birth of her tenth. Evelyn is laid to rest beside Frank Jr. and Joyce at Douglass Pioneer Cemetery, Troutdale. A Celebration of Life will be held on her 97th birthday; Friday, August 18, from 3 to 6 p.m. A 4 p.m. presentation will include stories, blessings and birthday cake. It will take place at the J. Frank Schmidt, Jr., Arboretum, 9500 SE 327th Ave., Boring. In lieu of flowers, the family suggests remembrances to Mt. Hood Hospice, the Leukemia & Lymphoma Society, or a favorite charity.